Today I want to share how our client, Skate Canada BC/Yukon, mastered the difficult task of attracting strong corporate sponsorship to their provincial sport organization. In this article, I’ll share some ideas on how to get corporate sponsors, using Skate Canada’s success as our inspiration. 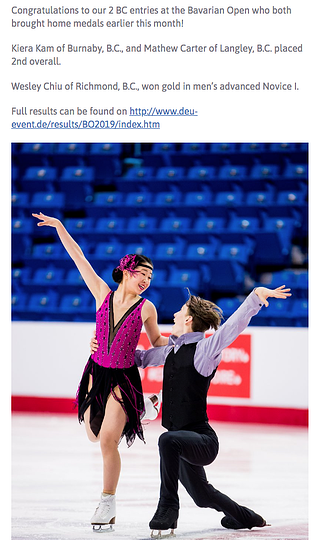 Skate Canada BC/Yukon is a thriving figure skating association. They’re dedicated to making the sport enjoyable for as many people as possible, while developing high-performance athletes with ambitions of skating on the world’s stage. They’ve created a flourishing member engagement program, and as a result, have attracted solid long-term funding commitments from high profile sponsors. Learn more about engaging members in our blog: 6 Steps to Transform Your Member Engagement Strategy. A big part of their strategy was creating an up-to-date, inspiring, and user-friendly website to act as the communication hub for members, athletes, volunteers, and sponsors. That’s why they came to us. We first designed Skate Canada’s website in September 2011. Since then, website visits have grown significantly. Today, the Association is stronger than ever, and continues to attract people of all ages to the sport while delivering high-value to its sponsors. Let’s take a look at key elements of their strategy to attract corporate sponsorship, and how their website plays a central role. How Does Skate Canada Successfully Attract Corporate Sponsors? To stay relevant and attract new sponsors, Skate Canada knows they must continually adapt. The organization’s leadership has long understood that things are always changing and, as an association, they must continually evolve. And they aren’t afraid to invest in new technologies and tools that help them do this. They’ve created a vibrant online community centred around their website and social media channels. They know having a strong digital presence is key to maintaining a healthy and relevant association—which in turn, makes it easier to attract corporate sponsorship. Tip: Assess your website and how it connects to your overall digital presence. Do you have an engaged online community? Does your current website demonstrate innovation in content and communication tactics? If not, it may be time for an update, as these are essential elements to attract new sponsorship investment in your association. Related post: 5 Questions to Ask When Building Your Member Value Proposition. Skate Canada’s website is capable of supporting live video streaming. They use this capability to live-stream skating competitions, and then archive the videos on the website for future viewing. The traction they’ve gained from this tactic is incredible. On competition weekends, the live streaming attracts viewership from around the world. 45,000+ website pageviews is not uncommon for a weekend’s activity. Skaters, their families, and the competition (sometimes from far away places like Korea and Japan) continually view the archived performances. Not just once or twice, but hundreds of times. So how does this help attract new sponsors? Current sponsors are featured in highly visible places, for example on the rink boards within the arenas. Thanks to the success of Skate Canada’s competition video streaming, sponsor logos on rink boards get huge exposure to new audiences: local, national and international. What company wouldn’t want exposure like that? Tip: Think about how you can share your sport using video. Come up with ways to provide sponsor acknowledgement in your videos, for example, on shirts, race bibs, side boards etc. Then create a strategy on where you’ll archive those videos—on your website and YouTube, for example. To learn more about using video well, see: 13 Video Marketing Pros Reveal Their Best Tips for Success. Skate Canada’s annual awards gala is a masterful example of how to deliver value to sponsors. Sponsors want to know that their “donations” are actually being put towards the intended goal. In Skate Canada’s case, the goal is athlete and personal development. 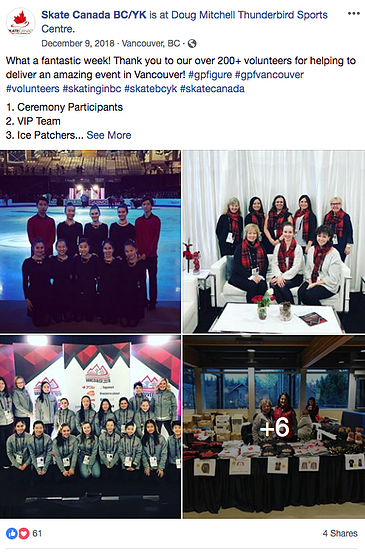 During the awards gala, Skate Canada makes a big effort to acknowledge sponsors, while connecting donations to athlete development. By being “in-the-room”, sponsors see first hand how their contribution to the Association transcends sport and connects to the fabric of a community. Also, Skate Canada’s website has a dedicated section that highlights the achievements of local skaters. They also celebrate skater achievements on their social media channels. So sponsors can see how their dollars are impacting the association year-round. Finally, sponsor logos are featured at the bottom of every website page, for maximum exposure. Tip: Find ways to celebrate the contributions of your sponsors. Use your website as a hub to acknowledge them year-round. Feature their logos on a dedicated sponsor page on your website. Inspire sponsors with website content and videos that show how their contribution is making a difference. Finally, use email and social media to promote in-person events where sponsors can be acknowledged in front of the association as a whole. Many, if not most, of the skating community’s driving forces are volunteers working from clubs dispersed throughout the province. And what amateur sport organization doesn’t survive on the shoulders of its volunteer nation? Skate Canada’s awards night is a special opportunity to acknowledge these amazing volunteers. They highlight the best athletes, while recognizing the back-room support that makes it all happen. The website’s volunteer page engages new potential volunteers and inspires them to sign up. They celebrate National Volunteer week every year, and encourage association members to honour volunteers in the community. They also do shout-outs to current volunteers on their social media channels. Tip: Celebrate your volunteers! Acknowledge them and the work that they do, and make sure volunteer needs are met first. When you honour your volunteers, the atmosphere in association becomes very positive. And who knows? Some of those volunteers could be your best leads for corporate sponsorship. The fact is, sponsors aren’t likely to come banging on your door. So, you’ll need to leverage your relationships to bring more of them to you. Skate Canada gets many of their corporate sponsors because someone in the sponsorship organization is closely connected to the sport—for example, a parent. Skate Canada’s Executive Director is incredibly active within the member community. He knows many of the athletes’ parents in the organization. He communicates the association’s vision to these parents, which helps inspire potential sponsors to come to the table. Tip: Catch up with members in person as much as you can. And don’t forget to leverage your website as a place to connect. Publish blogs and videos on your site, and give members an opportunity to comment on them. Consider adding a website forum where you can directly participate in conversations with members. Also, consider creating a Facebook group for members, where you can interact with them in a personal way on social media. I hope these strategies on acquiring corporate sponsorship have inspired you. Membership value is directly related to value that sponsors apply to your organization. We’re proud to have Skate Canada as a client, and are always inspired by their innovative member and sponsor engagement strategies. Ultimately, the more effort you put into your sponsor program, the more successful it will be. Member engagement is a key factor in securing corporate sponsors. Learn actionable engagement strategies in our white paper below.